How can we make a workload easier on cloud? In a previous article we presented the lay of the land for HPC workload management in an OpenStack environment. A substantial part of the work done to date focuses on automating the creation of a software-defined workload management environment - SLURM-as-a-Service. SLURM is only one narrow (but widely-used) use case in a broad ecosystem of multi-node scientific application clusters: let's not over-specialise to that. It raises the question of what is needed to make a generally useful, flexible system for creating Cluster-as-a-Service? Users will want support for the science tools they need, and when new tools are needed, the users will want support for those too. Users will want to get started with minimal effort. The learning curve they must climb to deploy tools needs to be shallow. Users will want easy access to the datasets upon which their research is based. Scientists certainly do not want to be given clusters which in truth are just replicated infrastructure. We must provide immediately useful environments that don’t require scientists to be sysadmins. The time to science (or more bluntly, the time to paper) is pretty much the foremost consideration. Being able to use automation to reliably reproduce research findings comes a close second. The right model for sharing. Do we provide a globally-available shared infrastructure, project-level multi-user infrastructure or per-user isolation? Per-user isolation might work until the user decides they prefer to collaborate. But can a user trust every other user in their project? Per-project sharing might work unless the users don't actually trust one another (which might in itself be a bigger problem). Users on the cluster. Are the members of the project also to be the users of the cluster? In this case, we should do what we can to offer a cluster deployment that is tightly integrated with the OpenStack environment. Why not authenticate with their OpenStack credentials, for example? In a different service model, the OpenStack project members are the cluster admins, not its users. If the cluster is being provided as a service to others who have no connection with the infrastructure, an external mechanism is required to list the users, and to authenticate them. Some flexibility should be supported in an effective solution. Easy data access. Copying user files into a cluster introduces a boundary to cross, which adds inconvenience for using that resource. Furthermore, copying data in requires the same data to be stored in two (or more) places. Where a cluster requires a shared filesystem, creating its own ad-hoc filesystem is unlikely to be the best solution. In the same manner as provider networks, a cluster should support "provider filesystems" - site production filesystems that are exported from other infrastructure in the data centre. Large scientific datasets may also be required, and are often mediated using platform data services such as iRODS, or HDF5 (note, that's a 5). Object storage (S3 in particular) is seen as the long-term solution for connecting applications with datasets, and does appear to be the direction of travel for many. However, sharing read-only filesystems, at either file or block level, are simple and universal approaches that work perfectly well. Both are also well-established choices. Scaling up and down. The cloud access model does not entail queuing and waiting for resources like a conventional HPC batch queuing system. Equally, cloud resources are assumed to grow and shrink dynamically, as required. Perhaps this could even happen automatically, triggered by peaks or troughs in demand. To maximise overall utilisation, cluster resizing is actually quite important, and managing all the resources of a cluster together enables us to do it well. Self-service creation - for some definition of self. Users shouldn't need to learn sysadmin skills in order to create a resource for doing their science. For some, the Horizon web interface might be too complex to bother learning. Enter the ResOps role - for example described in a recent SuperUser article on the Scientific WG - a specialist embedded within the project team, trained on working with cloud infrastructure to deliver the best outcomes for that team. To help the task of cluster creation, it should also be automated to the fullest extent possible. The OpenHPC project is an initiative to build a community package distribution and ecosystem around a common software framework for HPC. OpenHPC clusters are built around the popular SLURM workload manager. 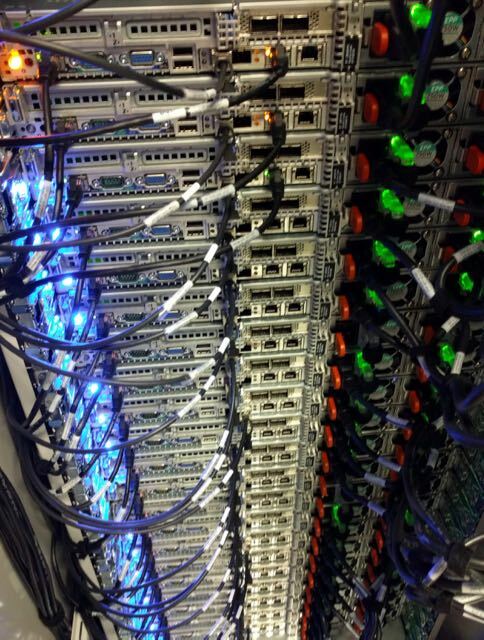 Independently, we have been working on our own OpenHPC clusters as one of our scientific cluster applications on the SKA performance prototype system, and I'm going to share some of the components we have used to make this project happen. DIB_OPENHPC_GRPLIST: "ohpc-base-compute ohpc-slurm-client 'InfiniBand Support'"
DIB_OPENHPC_PKGLIST: "lmod-ohpc mrsh-ohpc lustre-client-ohpc ntp"
Flexible infrastructure definition: A flexible definition is needed because it soon becomes apparent that application clusters do not all conform to a template of 1 master, n workers. We use a Heat template in which the instances to create are parameterised as a list of groups. This takes Heat close to the limits of its expressiveness - and requires the Newton release of Heat as a minimum. Some users of Heat take an alternative approach of code-generated Heat templates. Our flexible Heat template is encapsulated within an Ansible role available on Ansible Galaxy. This role includes a task to generate a static inventory file, extended with user-supplied node groupings, which is suitable for higher-level configuration. Authenticating our users: On this prototype system, we currently have a small number of users, and these users are locally defined within Keystone. In a larger production environment, a more likely scenario would be that the users of an OpenStack cloud are stored within external authentication infrastructure, such as LDAP. Equivalent user accounts must be created on our OpenHPC cluster. Users need to be able to login on the externally-facing login node. The users should be defined on the batch compute nodes, but they should not be able to login on these instances. Our solution is to enable our users to authenticate using Keystone on the login node. This is done using two projects, PAM-Python and PAM-Keystone - a minimal PAM module that performs auth requests using the Keystone API. Using this, our users benefit from common authentication on OpenStack and all the resources created on it. Access to cluster filesystems: OpenHPC clusters require a common filesystem mounted across all nodes in a workload manager. One possible solution here would be to use Manila, but our bare metal infrastructure may complicate its usage. It is an area for future exploration for this project. We are using CephFS, exported from our local Ceph cluster, with an all-SSD pool for metadata and a journaled pool for file data. Our solution defines a CephX key, shared between project users, which enables access to the CephFS storage pools and metadata server. This CephX key is stored in Barbican. This appears to be an area where support in Shade and Ansible's own OpenStack modules is limited. We have written an Ansible role for retrieving secrets from Barbican and storing them as facts, and we'll be working to package it and publish on Galaxy in due course. Converting infrastructure into platform: Once we have built upon the infrastructure to add the support we need, the next phase is to configure and start the platform services. In this case, we build a SLURM configuration that draws from the infrastructure inventory to define the workers and controllers in the SLURM configuration. In the first instance, cloud admins recreate application environments, defined by software and deployed on demand. These environments meet user requirements. The convenience of their creation is probably offset by a slight overhead in performance. On balance, an indifferent user might not see compelling benefit to working this way. Our OpenHPC-as-a-Service example described here largely falls into this category. Software-defined cloud methodologies enable us to do some more imaginative things in order to make our clusters the best they possibly can be. We can introduce infrastructure services for consuming and processing syslog streams, simplifying the administrative workload of cluster operation. We can automate monitoring services for ensuring smooth cluster operation, and application performance telemetry as standard to assist users with optimsation. We can help admins secure the cluster. All of these things are attainable, because we have moved from managing a deployment to developing the automation of that deployment. Our users have scientific work to do, and our OpenStack projects exist to support that. We believe that OpenStack infrastructure can go beyond simply recreating conventional scientific application clusters to generate Cluster-as-a-Service deployments that integrate cloud technologies to be even better.